Sianna, who is one of the most influential story tellers and teachers in my life, begins each of her myths in this way. It conveys the idea that you, yourself, are every aspect of each story - the landscape in which it exists, each of the characters that contribute to the dramas and even the one who is experiencing it. It is all within you. Often, we will relate to the hero or heroine in each of these tales. We learn about what is right or wrong, good or evil. We identify with and idealize the “positive and adored” characters and situations within each story. Let me ask you. When was the last time you really connected to the villain or the side kick? What parts of the story do you forget about or avoid, fast forward through or completely check out? We are about to embark on a journey where we will explore the current stories in our lives, reawaken the Goddess through sharing “HERSTORY” and reclaiming ourselves amongst the process. This is to bring you back home to your own sacred heart. To realign the relationship you have with the WHOLE of you, especially the parts that have been caste away. This is a journey into the dark, illuminated by prayer, ritual and the circle of women that sit before you right now. This experience is not for the faint hearted or the woman who is not ready to really gaze upon the distortions that have been created through lifetimes of cultural, familial and societal shame, guilt and repression. We will unlock tension and free up creative energy. By creating a right relationship with even the darkest shadows, we will truly step into our sovereignty as women. This is a calling forth, an invoking of the TRUTH of the totality of our bodies, minds and hearts. This is a reclamation of BEING. This is a returning to the SOUL. In embarking on this journey, we will first stop to listen to ourselves, deeply. We must be able to admit to ourselves the aspects of our lives that are no longer working for the highest benefit, the parts that are making us ill, unhappy and insane, the parts that are holding us back from change. We must stop running from the shadow that is chasing us, hold it compassionately and realign the power from within. In this session, you will be introduced to the facilitator and other group members. As a circle, we will cultivate a framework of safety and support, get to know one another and begin to hear the stories of the Goddess. You will learn about the Heroine’s Journey and have a deeper understanding of what shadow work entails as it relates to this process. The first session is all about welcoming and warming to the space, to one another and to this process. In this session, we examine Goddess stories from various traditions related to the regenerative power of death and fire. Building from our first session, you will be encouraged to dive deeper into the “why” of your presence in the circle. This session really marks the true threshold of transformation in this journey together, as each sister will be asked to begin opening up and being vulnerable - particularly with themselves. Through movement, meditation and sharing our own stories we will become more connected to one another and begin to burn away the tensions that hold us from the liberating force that is within. In this session, we soften into the watery center of our selves. 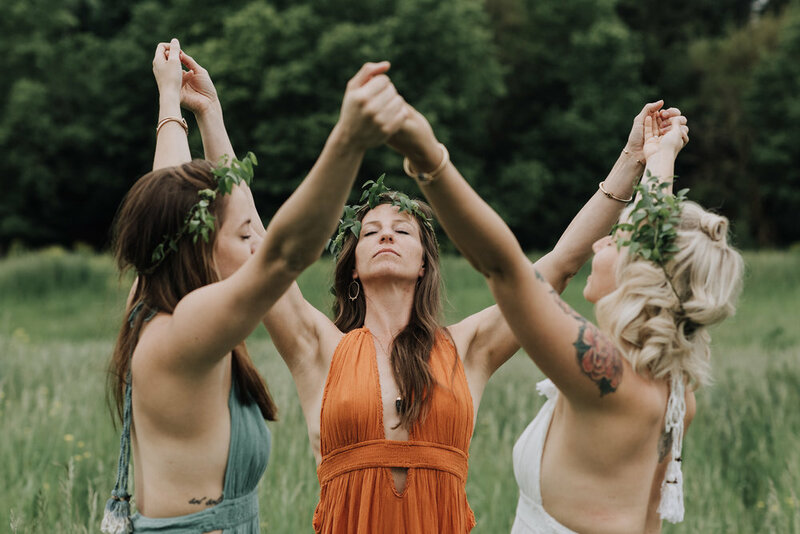 Diving into the stories of Goddesses related to sensuality and movement; our topics will primarily focus around the relationship with the self as it connects with our own willingness to feel both emotionally and sensually. Any particular shadows around sexuality, feeling and relating will begin to pour forth as we compassionately hold space for one another’s opening. We will continue to connect with our bodies through movement and let go of the need to control. In this session, we have the opportunity to engage in Earth Ceremony and Experience as we move our circle from the studio to nature. Being with horses for a part of the day, you will be asked to reflect into the sacred mirror that opens you to the both the beauty and the beasts within your own life. In particular, issues surrounding relationship with others (codependency, addiction, self worth and communication) will often surface during this session. Self care and grace will be empowered through our time together. Our final session together will close with both deep ritual, sacred reflection of the journey thus far and empowerment of where to go next. Sisters will have cultivated a bond with one another and we will harness the power of sharing, connecting and moving through various experiences that will create further clarity and connection. You will leave with tools on how to proceed in the journey, as this is truly just the beginning. We will be using present moment awareness, body sensing and deep journeys of meditation through sound, guided imagery and visualization to enhance your intuitive exploration. The wisdom is all within you, these tools are here to help you access it. There is something very profound that happens in the simplicity of writing with one’s hand. We have lost that art in some ways with technology. Journaling, especially when done consistently over time, can unlock gateways to our subconscious and offer a portal into the aspects of our unconscious. Shadow work is not something new, despite it’s recent re-emergence. Carl Jung was a notable source of exploring the shadow. Him and Freud were both pioneers in examining the subconscious mind through metaphor. One difference, though, was Jung’s preference for infusing it with spiritual work. Carolyn Myss - a great author, energy worker and shadow extraordinaire recommend that Shadow Work must always be rooted in spiritual practice. We believe this to be true as well. Just as we must root down into spiritual practice as we dive into this journey, we must also establish a foundation of trust with one another. In order to do this, we will establish TOGETHER an ever evolving grid of intentions and boundaries for our sacred circle. As we journey through this experience, we will mostly be communing at the studio. We will utilize both the large studio space, as well as the side healing arts room as well. There is a refrigerator, tea pot, coffee pot and water for your convenience. You are welcome to make yourself at home and ask that you treat the space as a sanctuary where sacred and healing practices are explored and communities gather. As our time together is limited, there will be times in which we connect or check in before, between or after sessions. But a bulk of the experience will be done together. Myth is sociological. It helps us understand relationships with ourselves and others. It engages us in life-customs and informs us, from childhood, on moral order, ethical laws and social roles. These can have both expansive and contracting consequences that are neither good nor bad, just something to be explored. Myth is psychological. It offers us an understanding of our psyche and gives us an opportunity to look in the mirror so that we may see something perspectives of ourselves that we might not otherwise experience. This is essential to the practice of shadow work and connecting with the subconscious. That being said, we will engage in some sort of ritual, prayer and movement of our bodies each session. We will teach you on how to set up your own sacred space at home so you can have a daily practice of prayer or meditation hat will bring you into the grounding chord of your heart and soul. This is the luminary that will light your way through the dark caves of the underworld. It will be what uplifts you so that you stay lit with intention and compassion. We ask That you connect with he belief system that resonates most for you and allow it to embrace you through this experience. Shadow work is a process that utilizes depth psychology, experiential work and other metaphysical tools to bring our conditioning out into the open. Through shadow work we release trapped energy that is not available to us consciously. Shadow work, although in depth and sometimes very uncomfortable, can expand us greatly into who we truly are. As facilitators, we do not determine what is shadow and what is not. It is up to you and your own subconscious mind to bring out what needs to be explored this time around in your dark journey with the Goddess and heal the wounds that are ready. You'll receive an abundance of wisdom that is both shared in circle with one another, online in our Private Facebook Group and in the Manual (Guide to the Goddess) that you will receive at the begin of the sessions. You will have access to the Facebook Group, which is a private, supportive community specifically for YOUR MFG circle. Here you can ask questions, receive support and find inspiration. I created Many Faces of the Goddess as a way for women to come together to unlock the tensions that they are experiencing inside their lives, their relationships and ultimately themselves. About five years ago, I was called to begin an intimate journey with the Goddess energy. Through bodywork, kundalini yoga and accessing Goddess wisdom through story, mantra and meditation; my life was forever changed. I didn’t realize working with the archetype of the Goddess would take me to some of the darkest places within myself. My whole life began to quake and shift. Relationships began to crumble, not in the way of falling apart, but in the way of expansion. It hurt, it was uncomfortable, it was exhilarating. After a period of deep chaos and destruction and finding a therapist and a teacher that could guide me through my darkest places, the aftermath began to settle into a new way of being. Old habitual patterns that were making me sick, depleted, depressed and suicidal were regenerating into creative, expansive energies that catapulted my way of living and feeling in this world. I wouldn’t say the journey is over, rather a whole new level of relationship was created. I now actively, with support, journey into my own underworld on a regular basis to access the shadows, reclaim them into my heart and stand in further soveriegnty within my life. I knew one day I would create a series in which women could gather in circles for each other and be guided deeper into their own lives. 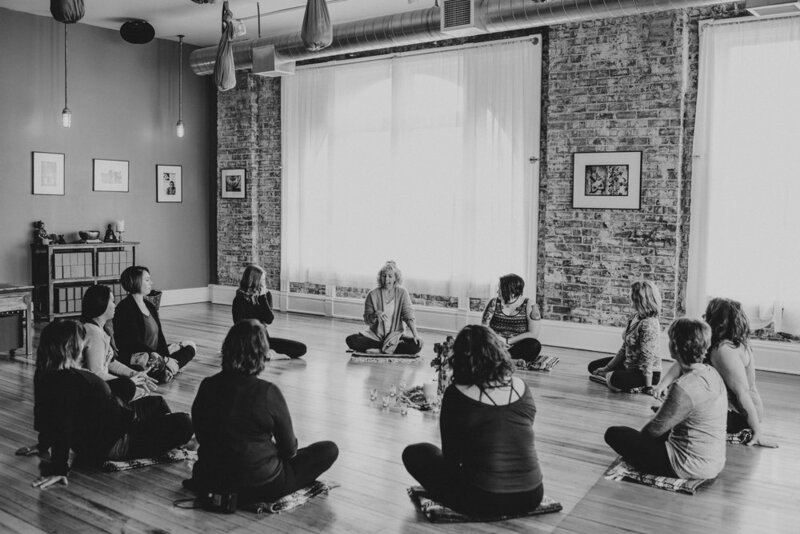 Having a circle of women and a teacher was essential to transforming my pain into my power. Sunday’s 8-5pm. Space will be limited to 9 sisters, allowing a deeply intimate experience for all. You are encouraged to bring a journal and wear comfortable clothing. A guide to the goddess manual will be provided to you. Payment plan: Payment plan available until August 1. 3 payments of $217 once a month until October. For more information, please contact us. How long is this program? Can I do it at my own pace? Many Faces of the Goddess is a 5 Session Series that is offered on specific dates for five Sundays in a row. We ask that you commit as much as you can to attending each session as they work sequentially and progressively with one another. If you do have to miss, still inquire about the program and we may be able to assist or plan in a way that is beneficial to you. What can I expect from the progam? Fear is natural - like going into a dark unfamiliar room. Excitement as it is a journey to becoming more whole. Be grounded in a community that supports you and is rooted in deeply divine and consistent practices of movement, prayer and ritual. To gain increased self respect, self rapport - to get to know who you are at a deep level, to understand more of what you value and a clarity of your eternal voice - not being afraid of your truth. What is expected from me in the program? Turn toward what you are afraid of? Dreams - turn towards what’s chasing you. Move towards the shadow - step by conscious step, no matter how slow or fast. Allow your heart to break a little Conscious transparency - allow whatever is inside of us to be seen. We choose, with discernment to be transparent. Being willing to blow the whistle on ourselves when we have “slipped” into the shadow - the round table. Who sits at the head? Relate to and not from our reactivity and foster relatable interconnection. What can I expect from you as the facilitator? Support and guidance that is grounded in my 10+ years of experience as a Licensed Mental Health Therapist working with women, couples and families. You can expect me to continue doing my own personal work as I can never take you further than I have taken myself - and we plan to JOURNEY DEEP! You can expect integrity, respect, compassion and accountability. I will answer all questions and concerns in a timely manner and be here to assist you in between sessions as needed. You can expect me to be honest, open and completely present with each and every one of you. What do I need if I decide to do this program? You will need a journal. A guide for the series will be provided to you at the first session. We ask that you wear comfortable clothes that you can move, rest and sit in for the day. We have a small kitchen and water, coffee and tea available. Feel free to bring a lunch; otherwise each Session allows for an hour lunch break where you are welcome to go out and eat. have questions? contact jackie here!